Following the visit of Chinese President Xi Jinping, who is also general secretary of the Central Committee of the Communist Party of China and chairman of the Central Military Commission, to Hong Kong, China's first aircraft carrier, the Liaoning, will visit the Hong Kong Special Administrative Region in early July and be open for visits from Hong Kong residents for the first time. Used for scientific research and in preparation for China's homegrown aircraft carriers of the future, the Liaoning, which was delivered and commissioned to the People's Liberation Army (PLA) Navy in 2012, has over 20 stories, 3,600 cabins, 20,000 sets of equipment and 1,000 non-commissioned officers. However, a recent television program revealed that while the Soviet-built craft was being renovated from 2005 onwards, 15 engineers died from work and one was too busy to see his wife before she died of cancer. These stories were told by Sun Guangsu, deputy chief designer of the Liaoning, on a program broadcast by China Central Television. Sun claimed that he was among the first batch of students to attend college after China resumed the national college entrance examinations in 1977. After he graduated from Harbin Engineering University in Northeast China's Heilongjiang Province, he went to a research institute focusing on warships. "It was not easy," said Sun. "When it was delivered [from Ukraine], we went inside, only to find it was in a mess full of empty beer cans and jars. It looked like a shabby hull and we had no documents, no standards about it." 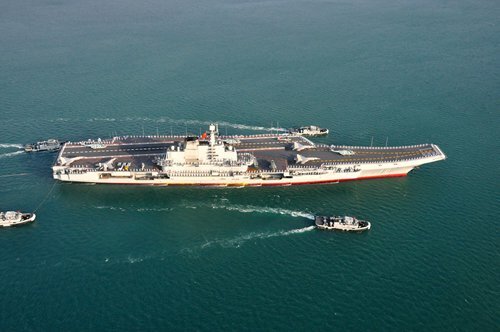 Wang Chunhui, director of one section of the carrier department that is responsible for aircraft maintenance, told the Global Times that China had never had an aircraft carrier before and did not know how to deal with the issues the carrier faced. So they had to go about solving them on their own. Besides, as there were no previous examples to follow, soldiers in different departments had to cooperate and experiment several times before they can make sure operational procedures go smoothly, said Wang. According to Sun, the wife of one of the deputy chief designers had been diagnosed with cancer but he had little time to stay with her. During a long business trip, his wife died and he did not even see her one last time. Moreover, other colleagues were lost during the reconstruction. Wang Zhiguo, another designer, said in an interview with the China Youth Daily that his team always worked overtime and they accomplished 30 months worth of work within 15 months, which helped save a lot of time for the following trials. According to Wang, about 15 of his colleagues died due to overwork. "Many of them were close comrades, and sometimes when I think of them, I can still feel that they were with me. It is painful," he said. Sun added that his team spent five years planning, designing, installing, producing and testing the carrier's systems. They did not enjoy any vacations, including the Spring Festival holiday. "We are very confident the institute is fully equipped with the ability to design a carrier independently." According to Beijing-based newspaper The Mirror, the institute Sun is referring to is the China Ship Development and Design Center. Located in Wuhan, Central China's Hubei Province, the institute has been dubbed "the cradle of China's warship." In the past four years, the Liaoning conducted exercises in the Yellow Sea, the South China Sea and the East China Sea before entering the Western Pacific. Three senior US officers and military commanders have visited the Liaoning in the past: The 24th Secretary of Defense Chuck Hagel, the 30th and the 31st Chiefs of Naval Operations Admiral Jonathan W. Greenert and Admiral John M. Richardson. In November 2016, the carrier's political commissar confirmed it is prepared to fight as the Liaoning left its shipyard in Qingdao, East China's Shandong Province, to start a new training mission. In a latest move, a flotilla with the carrier set out from Qingdao for a training mission. The formation includes the Jinan and Yinchuan destroyers, the frigate Yantai and a squadron of J-15 fighter jets and helicopters. The training mission, like previous ones, is expected to strengthen coordination among the vessels and improve the skills of crew and pilots in different maritime regions. In April, China's first domestically-built aircraft carrier the Type 001A was launched from the northeastern port of Dalian. The Liaoning was refitted at the same shipyard. The construction of the Type 001A began in 2013.